Live reporting gives you control and visibility of the performance of your contact centre. It allows you to react and make changes where necessary so that you can have immediate results and ensure that you meet your KPI’s. The reports can be preset to self generate at any time: hourly, daily, weekly, monthly, etc. and then emailed to either an individual or a group of recipients. The complexities of the reports are determined by the individuals requesting the data and can be fully customised. Reports can also be posted on a web interface to be viewed remotely. Reporting tools are open. We don’t limit our customers to what they want to do with their data. The reporting interface is easy to use and will provide you with analysis of any area of your contact centre’s performance. 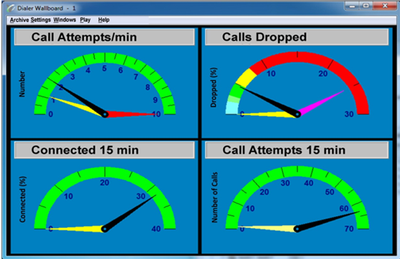 You can also display customised dashboards with real-time graphical statistics.